To celebrate the Holiday Season, 2Beerguys.com and Seacoastbeveragelab.com have teamed up with beer bloggers around the country to host the first annual beer bloggers advent calendar. This is the season of sharing and we intend to share our love of beer with you. 31 Bloggers Blogging – click here for the running list of beers/bloggers. Let’s see who is spreading holiday cheer today! 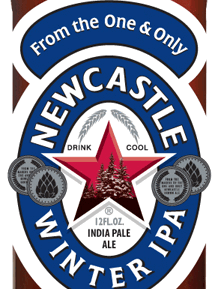 Zesty in character and jam-packed with a creamy finish, the Newcastle Winter IPA is full-bodied and hoppy, delivering unique and authentic malt flavors for the cold season and snowy matchdays. 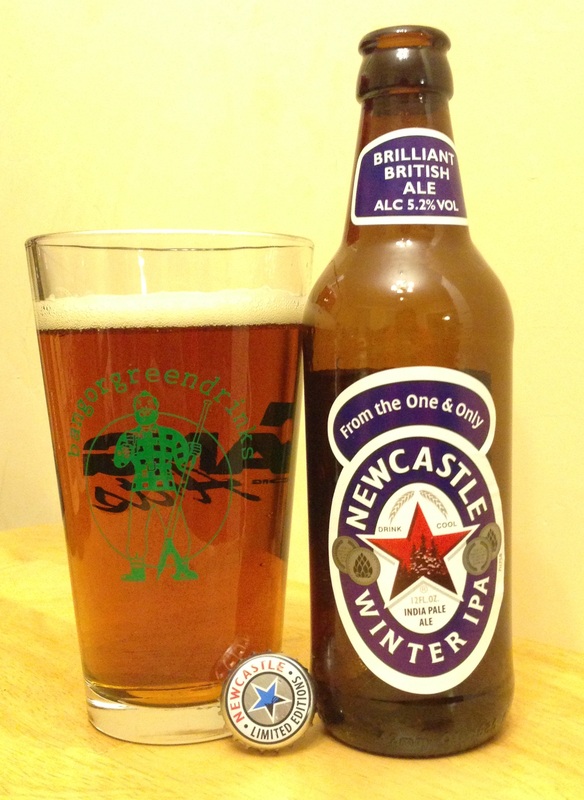 After work, I headed over to the local bottle shop to pick up a beer for this review, I had a few beers in mind but as luck would have it none of them were available so I picked up a bottle of Newcastle Winter IPA. I haven’t had a Newcastle in quite some time, the Brown ale was one of my “stepping stones” into the craft beer world and I occasionally sample the seasonals when they come out, having never had the Winter I figured I’d give it a shot. The Winter IPA is crystal clear in the glass and dark amber in color; pour produced a short white head. Smells pretty clean, some light malt coming through, picking up some caramel and toffee. The smell is similar to the Newcastle brown ale but not quite as strong. I did not detect any hops at all. Tastes malty up front, getting a sweet toffee flavor that gives way to a really easy bitterness. I don’t really feel like I would classify this as an IPA, I would lean more to calling it an English Bitter. The flavor really reminds of Newcastle Brown ale with a touch more bitterness. Has a slightly buttery mouthfeel. Overall not a terrible beer, just not a beer for me. I find all the Newcastle beers have similar smell and flavor, I would not hesitate to recommend this beer to someone who is a fan of their product but I wouldn’t send a fan of IPA’s out looking for a bottle of this beer. Newcastle Brown Ale, aka “The Dog”. Recipe developed by Colonel J. Porter, aka “The Original Dogwalker”, in 1927 in Newcastle, England.